Mozilla Firefox - Have it Your Way! There are many free web browsers on the market. One of the best is Mozilla Firefox. Often referred to as just Firefox, it includes features such as pop-up blocking, tabbed browsing, and increased security. Firefox's design allows the user to extensively customize the browser to their individual tastes and needs through the use of extensions and themes. Additionally, Firefox stores many hidden preferences which can be manipulated to turn on or off many other features. Firefox extensions are small add-on programs that add a new piece of functionality to the browser. These extensions can range from adding a new toolbar button to adding a completely new feature. The great thing about these extensions is that you can choose which extensions you want to add. This allows Firefox to stay small in size and run efficiently. The following is a list of the 25 of the best extensions for Firefox. They have been classified into three board categories: those that add additional enhancements to the browser and improve a user's experience, those that add additional enhancements to certain web sites, and those that are quite useful but only for certain segments of the population. In addition, a large list of Firefox extensions can be found at Mozilla's official extension site. Tab Mix Plus provides the user with complete customization over how tabs operate in Firefox. Options include changing the display appearance of tabs, protecting tabs, reopening closed tabs, and selecting how and where links open. Adblock Plus removes unwanted content, such as ads or flash, from a web page based on a set of user defined filters. A companion to Adblock Plus, Adblock Filterset.G Updater, automatically downloads the latest version of a set of filters which will block most ads on the web. Adblock Plus is an offshoot of the original Adblock extension. Greasemonkey is a Firefox extension which allows the user to modify web sites to improve functionality or appearance. This extension associates a bit of code with specific web pages. This code runs every time you visit the page, dynamically changing the appearance and functionality of a page. In many ways, these scripts are just Firefox extensions in a different format. The All-in-One Sidebar extension adds a sidebar panel to the browser allowing the user to quickly switch between windows, such as the downloads, extensions, or themes window. Inspired by the Opera sidebar, this extension includes a toolbar which can be customized. SpellBound provides a spell checker similar to one seen in a word processor. As a word is entered in any text box on the page, Spellbound highlights the misspelled words with a red dotted underline. The spelling can then be easily corrected by clicking on the red underlined word and Spellbound will pop up a menu with potential corrections, providing a choice of which word to replace. Reveal shows thumbnails of open tabs or as browsing through the history list. It can be managed using the keyboard or the mouse. There are two quality and similar extensions available that operate in much the same way: Viamatic foXpose and Showcase. The PDF Download extension allows the user to choose how to handle PDF (Adobe Acrobat) files. Every time a PDF link is clicked on, this extension offers the choice of whether to open the pdf file inside a new tab, download it to the computer, or view it as HTML. IE View Lite provides one-click access to Internet Explorer for a selected page from the Firefox context menu. A neat thing about this extension is that it will allow you to jump to any browser, such as Opera, by changing the IE path in the extension settings. In addition, you can set any site to open in IE whenever it is loaded in Firefox. The All-in-One Gestures extension provides for management of mouse gestures, scrolling, and power navigation. Foxy Tunes places controls for the media player of your choice within the Firefox toolbar. You can pause, forward/reverse, play, adjust the volume, and view what is playing. Almost all major media players are supported. You can find a number of FoxyTunes skins here. Download Them All will download, in just one click, all the links or images contained in a web page through a set of customizable filters. The Wizz NewsReader is a fully functional news reader extension. It works with works with Atom 0.3, Atom 1.0, all versions of RSS, and supports Podcast feeds. Image Zoom provides control of the size of images that are displayed in Firefox. Images can be zoomed in or out, to allow for easy viewing of images. Livelines allows for the customization of the “add live bookmark” icon found in the Firefox location bar. Instead of adding an RSS feed as a “live bookmark” within Firefox, Livelines can add the RSS feed to an online aggregator, such as Bloglines or Feedlounge, or to an desktop based RSS software, with a click of the mouse. Webmail Compose will accomplish a similar idea with email. Webmail Compose opens a selected webmail program's (e.g. Hotmail, Gmail) compose window if any email addresses are clicked on. Some of the most popular Firefox extensions have memory leaks, will slow your browser down and/or create conflicts with other programs. 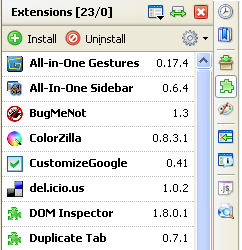 Some of these extensions include FasterFox, IE Tab, Session Saver, and Tabbrowser Extensions. An article at MozillaZine lists known extensions that will cause side effects in Firefox along with recommended workarounds. It is up to you to decide if the extra feature an extension provides is worth the issues caused by a particular extension. Customize Google enhances the main Google search page results by adding extra information on the page such as quick links to Yahoo, MSN etc. and removing unwanted information like ads. The del.icio.us extension integrates del.icio.us into Firefox. It adds buttons to quickly jump to del.ico.us and post new entries. Alternatively, if you store your bookmarks in Firefox's bookmark manager you can use Foxmarks to easily sync bookmarks across computers. Gmail Manager allows for the management of multiple Gmail accounts and receiving new mail notifications from the Firefox status bar. It displays account details including unread messages, saved drafts, and space used. BugMeNot uses a database of usernames and passwords to log you into a web page. Right-click on the username or password field, choose "BugMeNot", and the login information will be entered into the form. BugMeNot works on most popular members only web sites. The StumbleUpon Firefox extension is an interface to the StumbleUpon site, a large community of users who make reviews and recommendations of websites to other users. The extension allow you to rate sites as your browse them, add reviews, and view reviews submitted by other users. Several Firefox extensions are designed to help manage rest of the Firefox extensions on your computer. The Update Notifier Firefox extension notifies you when updates are available for your extensions and themes by displaying several update icons in the browser. This extension makes i easy to check for any available updates and then apply those updates. The Firefox Extension Backup extension backups all extensions, themes, bookmarks, and preferences. A companion extension, Compact Library Extension Organizer bundles everything into a single .xpi file that you can easily install into any installation of Firefox. Thus you can package up all of your extensions and easily install the .xpi into a profile or installation of Firefox, just like installing any other Firefox extension. Currently these extensions are for Windows only. Performancing for Firefox is a full featured blog editing extension for blogs such as Blogger, Movable Type, and WordPress. It includes draft support, del.icio.us integration, ping support, and Technorati support. Scrapbook allows the user to save Web pages to the computer, highlighting text and creating sticky notes on these pages at the same time. In addition, Scrapbook includes the ability to perform full text searches and filtering of the saved pages. Book Burro searches for the lowest price on a book. When it sees your are looking at a page with a book, it will display a small panel, on the screen, which when opened lists prices at online bookstores such as Amazon, Buy, Half, and more. This extension takes a screenshot of a web page in several different ways. Most importantly, it allows you to capture the entire web document that you are viewing. Because of security concerns, Firefox forces every extension installed to be in a list of acceptable domains. Consequently, there are two different ways you can install Firefox extensions. One is the "official" way and one involves dragging and dropping. Click the link to install the extension. Click on the 'Edit Options' button in the yellow bar at the top of the screen which says that the extension was blocked. Click on the 'Allow' button to allow that domain to install the extension and then click on the 'Close' button to exit the window. Click the install link again and a software installation window will appear. Then, click on the 'Install Now' button to install the extension. Drag the install link into the address field of the browser. A software installation window will appear. Click on the 'Install Now' button to install the extension. Note: You will need to shut down and restart Firefox for a newly installed extension to work. As described above, Greasemonkey is a Firefox extension which allows for the modification of web sites to improve functionality or appearance. It does this by associating a bit of code with specific web pages. The best Greasemonkey scripts are highly dependent on what web sites a person visits, thus it is hard to come up with a "best of" list. That not withstanding, here are some of the best scripts which modify some popular web sites. A large list of Greasemonkey scripts can be found at userscripts.org. This script modifies Bloglines, so that archived news items are hidden from view unless explicitly asked for. If you use Bloglines frequently, this script alone makes Greasemonkey worth installing. This script adds preview bubbles to conversations in Gmail. Right-clicking on any conversation, in Gmail, brings up its recent messages in a preview bubble. This script is a good example of how Greasemonkey can change the look of a web site. It changes the del.icio.us font from Arial to Georgia with blue links and orange visited links. Adds new options to the Digg menu such as 'Dugg' or 'Commented On'. Right-click on the script link and choose 'Install User Script' from the context menu. Refresh the page to show the script’s effect on that page. Platypus is a Firefox extension which allows the user to modify a Web page, from within Firefox, in a what you see is what you get environment. These changes can then be saved as a Greasemonkey script. Platypus is "Greasemonkey for the rest of us". 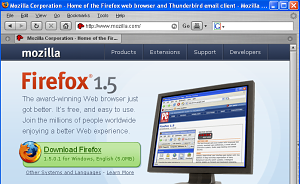 Many Firefox users do not take advantage of or customize their Firefox Search Toolbar. By default Firefox comes with a few popular search sites, such as Google and Yahoo, in the Search Bar in the upper-right corner of the browser. There are many more that can be added. Below are some of the best Firefox search engines. Search Wikipedia, the free, user-contributed encyclopedia. Search Technorati, a real-time search engine that keeps track of what is going on in the blogosphere. Provides weather information by city, state, or zip code. Provides stock quote look-up and financial information. Search through the del.icio.us bookmarking site. Search WebMD, providing health information and tools for managing your health. Search for photos on the popular photo service, Flickr. Quickly bring up a Google map for a given location. Alternatively, get the Yahoo Maps search engine from here. New search engines can quickly and easily be installed into Firefox. Just click on the search engine's install link and a 'Add Search Engine' window will appear. Click on the 'OK' button and the search engine will be installed and ready to use. Deleting a search engine can be done manually or through an extension. To delete the search engine manually, you must open your Firefox search plugin folder (most likely C:\Program Files\Mozilla Firefox\searchplugins). Then delete both the ‘.src’ file (search plugins end in extension ‘.src’) and the associated ‘.gif’ or ‘.png’ file for the search engine. Alternatively you can use the SearchPluginHacks to quickly remove search engines. This extension adds a right-click menu to the search plugins drop-down list, allowing for quick deletion of unwanted plugins. Besides deleting search engines, you can easily reorder the search engine drop down list by using the Search Engine Ordering extension. One annoyance with Firefox is that out of the box the Firefox search box is so small. The size of the box can be changed using several different Firefox extensions. The Searchbar Autosizer extension makes the searchbar fit the contents of the text, auto expanding the searchbar as needed. Likewise the Resize Search Box extension will change the default width of the Firefox Search bar to the desired size. Rollyo has created a tool that enables Mozilla Firefox users to create toolbar search engines, of up to 25 sites, very quickly. These search tools will install in the upper right hand corner of your browser along with the other search engines. It is a very simple process to create one yourself or use one someone else has created. Create your own search engines, with Rollyo, here. Firefox supports a variety of themes/skins which changes Firefox's external appearance and interface. These themes are often based on popular icon sets or different operating system. Some do nothing more than change the icons while other change the whole look and feel of Firefox. Below are five of the best and most complete Firefox themes. A large list of Firefox themes can be found at Mozilla's official theme site. A complete theme inspired by the graphics and work of Max Rudberg. Brushed has a Mac OS feel to it. A icon based theme. Has a corresponding theme for Mozilla Thunderbird. An Aqua, grayish theme for Firefox. A complete theme with shiny round buttons and light gray background. Based on the Orbital icon set by Florian Freundt. A complete theme. Based on the Crystal SVG (for Linux) icon set by Everaldo. Has a corresponding theme for Mozilla Thunderbird. Open all the tabs you would like to bookmark. From the Bookmarks menu in Firefox, select the 'Bookmark all tabs' option. The next time you want to open all the sites listed in the folder, go to the bookmark and select the 'Open in tabs' option at the bottom of the list. Besides installing new themes, you can also customize Firefox's interface by moving and manipulating its various buttons, fields, and menus, and adding and deleting entire toolbars. 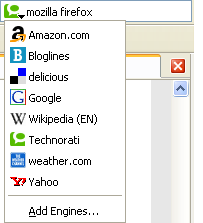 Firefox allows the user to choose which buttons you want to show on each toolbar. To customize a toolbar go to View --> Toolbars --> Customize. A new window will pop up containing all available toolbar items. Just drag and drop an button to the toolbar where you want to add it to. To remove a button from a toolbar, drag it from the toolbar and drop them into the Customize window. In addition you can save some screen space by making your toolbar icons small. To do this go to the Customize window and check the "Use small icons" box. Open all the tabbed pages you want to use as home pages. Open the Tools --> Options --> General window. Underneath the home page location bar is a button marked 'Use Current Pages'. Click on this button and Firefox will automatically make all the tabs, that are open, your home pages. Firefox's Bookmarks Toolbar is a good place to save your most commonly used bookmarks. The easiest way to create a bookmark on your toolbar is to highlight the site URL in the address bar and drag & drop it to the toolbar. If you would like to rearrange the order of your toolbar bookmarks, simply drag & drop the bookmark from its old position to a new one. To do this, just click on the bookmark and hold the left mouse button until the arrow appears where you want the bookmark to be. Finally, if there are too many bookmarks on the toolbar you can remove the title from each bookmark. Then only the favicon of each site will be shown, freeing up screen space (see image below). Open the Bookmark Manager by going to Bookmarks --> Manager Bookmarks. Right-click on a bookmark, and select Properties. In the Keyword field, enter the word you want to use. You can now use that word in place of the site's URL in the address bar. For example, typing Firefox in the address bar will now take you to http://mozilla.com/firefox. In addition to the items mentioned above, Firefox is fully customizable by editing its configuration files. There are three main files you should be aware of if you want to make any advanced customizations. All of these files are plain text files, stored in your profile folder, and can be edited using a standard text editor such as Notepad. Note: When editing these file you should always close all open instances of Firefox first. A file called Prefs.js holds most of the Firefox preferences which are set in the Tools --> Options menus. This file is automatically generated by Firefox and updated whenever changes are made to the Options menus. Do not manually edit this file. Instead add customized preferences to a new file in the same directory as Prefs.js called User.js (Alternatively, you could use the 'about:config' method covered separately below). The main use for User.js should entail backing up custom tweaks to another machine/install or manually deleting about:config entries. userChrome.css is a style sheet which controls the Firefox interface. Inserting various commands into this file will modify the way Firefox looks. Note: This file doesn't exist by default in your Profile folder. You will need to create a new userChrome.css file in the \Chrome subdirectory of your Profile folder. UserContent.css is a style sheet which controls the way web pages are presented in Firefox. Note: Like userChrome.css this file does not exist by default in your Profile folder. You will have to create a new UserContent.css in the \Chrome subdirectory of your Profile folder to use it. Before making any changes you should make a backup of your current Firefox Profile. This will allow you to quickly return your Firefox environment to as it was before you started making any charges. The simplest way of making a backup of your profile(s) is to copy everything under the \Profiles directory (typically located under your \Documents and Settings\[Username]\Application Data\Mozilla\Firefox\Profiles\ directory.) to another location. You can then restore this backup at any time by copying it over the current existing profile. Alternatively, you can create an new profile, by using the Firefox Profile Manager, to test any changes. To access the Profile Manager, first close all instances of Firefox then go to Start --> Run and type "Firefox.exe -profilemanager" (without quotes) and press Enter. From here you can create a new profile. The following is a list of some of the most useful userChrome.css customizations. For any customization you would like to make just add its code to your userChrome.css file. The Bookmarks Toolbar is not limited to one row. It can display multiple rows by adding the following. If you do not like the autocomplete feature in the address bar you can disable it. You can use a custom background image for your Firefox toolbars. Note: the image must be in .GIF format, and be placed in the same directory as the UserChrome.css file for this tip to work. You can easily change the color of the active and normal tabs. Just edit the values shown in the rgb color: lines. For a listing of rgb color codes please see this article on Wikipedia. On the right hand side of the tab bar there is a close button. You can remove it. If you have items on a Firefox menu that you never use, you can remove the item from the menu. Note: menu items include File, Edit, View, Go, Bookmarks, Tools and Help. If you use the Sidebar you can switch the sidebar to display on the right side of the screen. You can increase the width of the Firefox search box to any size (in pixels). Below is an example of a userContent.css customization. For any customization you would like to make just add its code to your userContent.css file. You can change your default cursor to a crosshair whenever you put your mouse over a link opening in a new window. Below are several examples of a user.js customization. For any customization you would like to make just add its code to your user.js file. Sometimes the size of a frame on a web page is not the size you would like it. You can force all frames to be resizeable. To quickly and easily access a whole range of customizations and preferences, simply open Firefox, go to the Firefox address bar and enter in the URL "about:config" (without quotes) and press Enter. Firefox displays a large range of preferences sorted alphabetically. This is a powerful way to tweak your settings in ways that are not accessible through Firefox's Options menu. Note: You can change the value of these settings quickly by double-clicking on them: booleans will toggle from true to false while integers and strings will open a dialog box allowing you to input a value. Some of these settings are crossovers with others mentioned above. Choose which way you feel most comfortable using. browser.block.target_new_window — when set to true links which open in a new window will open in the current window instead. browser.search.selectedEngine - the name of the current default search plugin. browser.search.update - when set to true Firefox will automatically look for search plugin updates. browser.triple_click_selects_Paragraph - when set to true clicking three times in a row on a paragraph will cause the paragraph to be selected. browser.urlbar.clickSelectsAll - when set to false clicking in the address bar will place a cursor where you click without the text being highlighted. browser.xul.error_pages.enabled - when set to true an error page similar to IE will appear when a page load fails. keyword.enabled - when set to false only a location can be entered in the address field. keyword.URL - when set to http://www.google.com/search?btnG=Google+Search&q=, a search from the location bar will take you to the Google search page instead of using the Google "I am feeling lucky" search. layout.frames.force_resizability — when set to true the user can resize the frames on a site. network.prefetch-next - when set to false disables Google prefetching. Note: Any changes made using the about:config method are stored in the Prefs.js file in your Profile folder. You should backup the Prefs file before using the about:config method. Changes made using about:config cannot be "undone" without editing or restoring the Prefs.js file. Firefox Home Page - the official home page of Mozilla Firefox. Firefox Extensions & Themes - the official Firefox Add-ons directory. Firefox Support Forum - Firefox support at Mozillazine. Download a free e-mail and news client developed by the the same people who brought you Mozilla Firefox. Mozilla Thunderbird features anti-phishing protection, junk mail filters, powerful search features, RSS capabilities and much more. Asa Dotzler - community coordinator for several Mozilla projects. Blake Ross - one of the early contributors to the Mozilla Firefox project. CyberNet Technology News - Mozilla Firefox news and tutorials. Indistinguishable - Jesse Ruderman's Mozilla themed blog. Inside Firefox - by Ben Goodger, the lead engineer for Mozilla Firefox. Lifehacker - Mozilla Firefox news, recommendations, and reviews. Flock is a web browser based on the code base of Mozilla Firefox. Flock is designed to be a "social browser", allowing users to interact with popular social networking web services such as Flickr, Del.icio.us, Technorati, and other services. Firefox Cheat Sheet - A one page cheat sheet bringing together Firefox’s keyboard & mouse shortcuts and where to find things in Firefox onto one simple to view page. Firefox Tutor - articles and tutorials on Firefox features. Firefox Tweak Guide - in-depth guide from Koroush Ghazi on how to customize Firefox. Rapid Web Development and Testing with Firefox - A S5 slide presentation detailing the best Web development tools and extensions available for Firefox. Portable Firefox is a version of Firefox packaged as portable app which you can run from a USB drive. This is also a handy way to run the newer test versions of Firefox and not mess up your regular Firefox settings. Firefox Wallpapers - a variety of Firefox desktop wallpapers in several sizes. The Firemonger Project - download and burn Firefox, Thunderbird, Extensions, and Themes to a CD for easy installation. Created by LeslieFranke.com. Got Questions or Comments? lesliefranke at gmail.com. Last updated 07.06.06.